moment. It was in 1944 at the Scapa Flow Naval Base. Orkney Islands. froze rooted to the spot expecting at least ninety days in the cells. but Admiral Harwood was a very understanding man. entire staff of cooks, stewards and drivers to attend. my demob from the Navy. employed as cook and I as house parlour man and valet to Captain Soames. A large room at Chartwell had been converted in to a private cinema. the front in a large armchair with his family and guests round him. visited his daughter, he was always very pleasant. I am Susan Penfold (nee Fowler). My Dad was Ted Fowler, who was a policeman in Rye, when in the late 30’s, 40’s and 50’s anyone still still living in Rye form that era will probably remember him! Rye was well policed in those days, with the Police station situated in Watchbell Street at the back of the Church. My Mum and Dad were married in 1935, when my Dad was a, “Bobby”, on the beat in Battle for two years before moving to Rye in 1937. They lived at 3, South Undercliff, my friend Joan Tillman’s family lived at 39, South Undercliffe and Win and Alf Britt lived next door to us. “Aunt” Win, as she has always been known to me and who was a good friend of my Mum, (Marjorie Fowler) is still living in Rye today. We still keep in touch, especially at Christmas. I was born in 1938 and my sister, Angela, born in 1944. During my Dad’s time in Rye, he was partly on the beat and also used to ride what I term a ,”Pop Pop” bike. I remember a lot of the kids were scared of him, including my sister and I. He would probably turn in his grave knowing how the Policing of, not only Rye, but the whole country has changed for the worse. I remember, when we were young my sister and I went, “Scrumping”, and took our ‘goodies’ home to our Mum, but Dad was already home for his tea and he made us return our ‘goodies’ as well as other punishment. 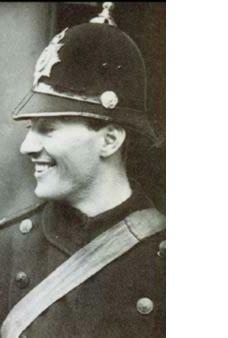 I also remember that the Inspector at the time was Charles Dalloway, the Sargeant was Fred Balcombe. During the war years whilst living in South Undercliffe when the sirens went off we used to have to go to the air raid shelter in the road, I remember my Mum used to grab Angela and I took our dog ‘Gip’ a King Charles Spaniel. In the shelter you could hear the drone of the aircraft and the, ‘Doodle bugs’, Dad would be on duty somewhere in the town in case of casualties. In 1949 we moved from South Undercliffe to 14, New Winchelsea Road and my Dad was moved to the CID department in Rye. I also remember Aunt Win moving to the Lock keeper’s cottage on Harbour Road. My Mum was an ardent member of the Women’s Institute and also in the church choir. My Dad was a Mason and was a member of two Masonic Lodges, one in Rye and the other, I believe, in Northiam. I went to Rye Primary and Secondary schools and later to the Grammar School. I always wanted to be a nurse that’s why I had to go to the Grammar School to obtain ‘O’, levels before I could apply for nursing. Jo’ Vincent will know this. The exam to get in was hard but I managed it. At 13 years I was lucky to be able to do voluntary work at Rye Cottage Hospital when Matron Price was there. How I loved the Sundays there at that hospital with its little operating theatre and two wards, I really enjoyed it. The Bonfire night used to be good, my Mum, Angela and me used to be on a float in the procession, it brings back such happy memories. I often wonder what happened to so many people from the Secondary school, Grammar School, names come and go as you try to recall, the name I most recall, is John Beckingham from Camber, who in the early fifties was unfortunate to contract Polio and I believe was in an iron lung and wondered over the years how he progressed. I recall Dr. Hartley having his Surgery in the Mint, and Glaziers the grocery was on the corner. I remember the Mayor of Rye throwing pennies from the George Hotel balcony on ‘Maundy Thursday’, to the school children, also Gregory Peck coming out of the George entrance and I was in the front of the crowd and I turned to Mum and said, “Isn’t he lovely!” He heard and replied, grinning, “Yes I am”. Since living in Somerset and having visited Lynmouth, I recall that after the flood disaster, our parents collected blankets and clothing for the victims in 1953. We left Rye in 1954 when my Dad was transferred to East Grinstead Station, I was 16 and it was lucky for me as the Queen Victoria Hospital was where plastic surgery was carried out on many servicemen from the war by Sir Archibald McIndoe and I passed the entrance exam and did a Pre- Nursing course for two years before moving on at the age of eighteen to begin General nursing at The Royal East Sussex Hospital in Hastings. In those days the hospital was part of a group including St Helen’s, Bexhill and the Buchanan. I did my preliminary training at the Royal East Sussex Hospital and chose Bexhill hospital for my training. It was hard work but worthwhile, we were trained properly with Matrons in charge and hospitals will never be the same until they return the Matrons. I finished my training and then did a silly thing and got married in 1961 to a naval man and spent a lot of my time in Portsmouth and Plymouth. I was unlucky and lost four babies and ended up being divorced in 1972. After my divorce I lived in Gosport, Hampshire and worked in a psychiatric hospital near Fareham,when I met my second husband in 1974, who ironically was a Policeman, when as a dog handler with the Police he came to search for a missing patient.We married in 1977 and celebrate our 25th Wedding Anniversary this year. My Mum died in 1981 and my Dad in 1987. My sister Angela, was at one time living at the McArthy retirement development, Strand Court, where her husband was the Resident Manager. He died in 1996 and Angela tragically took her own life in 1997 on their Wedding Anniversary. It is something I will never get over or forget. My husband suffers from severe Rheumatoid Arthritis and had to retire earlier than expected from the Police, so we decided to move to Somerset to a quaint old Market town called Crewkerne. As we are both not in the best of health we are glad that we made the effort in our younger days of having some good holidays, mainly to Canada where we have seen much of its beautiful countryside as well as the cities.